Designed by Apple Inc., AirPrint is an iOS based feature which makes it possible for IPads and IOS 4.2 IPhones and above to directly print wirelessly using the Local Area Network technology. Originally meant for iOS devices and working via Wi-Fi connections only. An advancement made it possible for the AirPrint protocol to be made possible via Ethernet connections in desktops. The receiving printer must have the AirPrint feature and be compatible in order to print from an iPhone or iPad. It can also work through computers running on Microsoft Windows Linux and macOS. Interestingly, there are no drivers required for one to make the printing possible. The list of printers that support or work with the AirPrint technology is quite limited. It is only supported by the HP printers. This does not deny other printers from enjoying the high tech printing technology. Thanks to the excellent AirPrint Activator which welcome other printers on board to work using the AirPrint technology. Epson wireless printers on the other hand are not lagging behind. They have scrutinized the technology and make a comeback with a free application. This application is in a way universal. It supports a majority of the AirPrint printer lists. Commonly known as the Epson iPrint, it can be supported by 21 Epson printers from the Stylus, Artisan, Workforce series and the Stylus photo. The officially recognized list of printers that support AirPrint still lies at around 28 HP Printers. Use any nearby Epson printer to print wirelessly all functions built in one printer. Make printing an activity worth by printing webpages, files such as PowerPoint®, Excel®, PDF documents, Microsoft® Word among others, not leaving out favourite photos. Epson lets you scan document and save them ready to send through various ways like email. Besides, online files in Box.net, Evernote or Dropbox can be supported by the printer. Actually, iPrint by Epson makes printing convenient and easy. Print with the help of your wireless network to different Epson printers. Apparently, I have not had a chance to use the application because, I don’t use an Epson Printer. Honestly according to me it sounds like one of the most convenient options for printing wirelessly. The fact that it works from an iPad rather that a MacBook or iMac, is a great convenience. 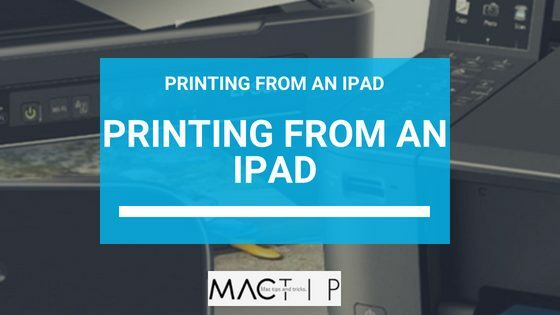 If you need to print from a Mac, it is also very much possible. If may be you have a chance of using the application, feel free to share with us your experience in the comments section below. How to Set Location Services On Your iPad?